Motivating customers to TAKE ACTION! Most people get excited when they first see a solution that will help them tackle their biggest issues. They download the e-book, sign up for the course, buy the video series…. and take the first action. But motivation starts to sputter out as day-to-day life intrudes or results are slow to come. That's where running some type of 30 day challenge can have a huge impact on success. And not just the success of your customers, but also the growth of your business. Customers who see results come back for more and spread the word about how much you helped them. A ‘challenge' in this sense of the word is a series of actions that your participants take every day for a set period of time. You tell them what to do each day, they take that mini action, and you continue to motivate them until they see the targeted results. And it doesn't have to be 30 Days. It could be 7 days, 14 days, 30 days, or even 100 days! So what do you need to do to create an effective challenge? Identify the goal for your challenge in terms of how it will benefit your business. You're not creating a challenge just for the sake of it. There has to be a tie-in with your own business goals. Do you want more sales as a result? More customer testimonials and success stories? Your business goal will help you determine the type of challenge you run, who participates in it, and how you structure it. Identify exactly what you will be challenging people to do. A great way to get ideas is to look at what your competitors have done, or are doing now. Then look at what your own customers find most challenging or have been asking you about most often. Pick the focus for your challenge and make sure it's something achievable. Set the time-frame for the challenge based on how long you think it will realistically take to achieve a result. It doesn't have to be 30 days! Will your challenge be online, in-person, or a combination of both. Depending on the venue, you will need to create different types of content. Create a profile of your target challenge participant. Will your challenge be open to everyone or just to a specific group of people, such as your current customers? How much will you spend on putting together and running your challenge? For example, do you need to outsource anything? Will you pay for advertising? Do you need to buy some content to use as your starting point (eg from Content Sparks)? Outline exactly what content you need to create, where you will distribute it, and when. For example, what content do you need to send to participants each day? What content will you post on social media during the challenge? Make sure all your content follows a logical, step-by-step flow that guides your participants and motivates them to complete the challenge. What tactics will you use to attract people to your challenge and what tools will you use? How will you gather data and stories from participants after the challenge? How will you build buzz for the next challenge? What metrics will you track to monitor the success and effectiveness of the program? And, while you're at it, what types of products and services can you market to challenge participants after the challenge? If you've already answered the questions and completed the previous 7 steps, you're ready to launch your challenge. To make sure it goes smoothly, make a list of all your action steps and deadlines. Here's where a trusty project management system comes in handy. We love asana. So that's the big picture for the steps to follow to create your 7, 14, 30, 60 or whatever number of days challenge. But as you can probably already guess, one of the most time-consuming parts of all of it is the content creation. Luckily, you don't have to create all the content from scratch! 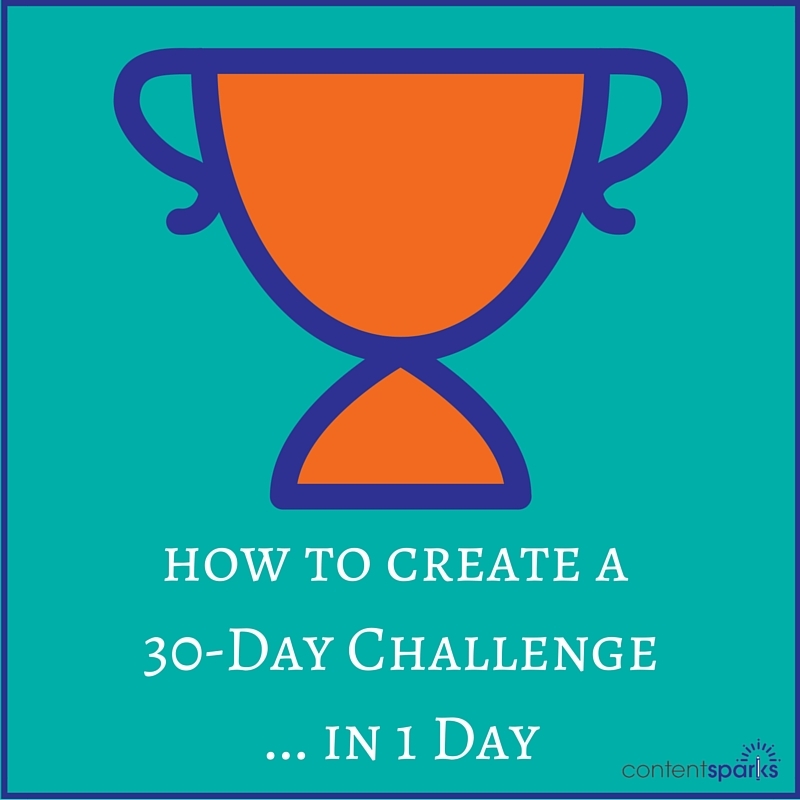 Here's how you can pull together your own 30 Day Challenge in a day or so, using your ready-to-go content from Content Sparks. You'll need to fill in any gaps or delete content, just like you would with any done-for-you course, based on what your challenge participants know or don't know already. 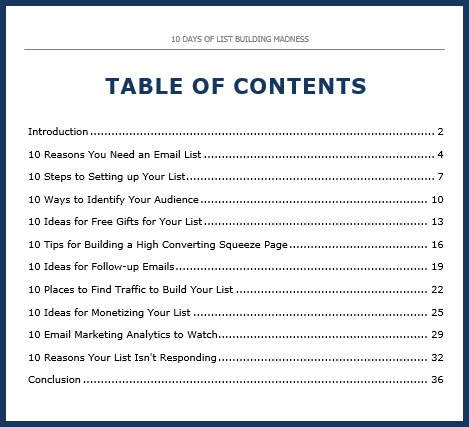 In the 10 Days of List Building, each chapter is broken into 10 points. And each has a learning activity. However, some of the activities are longer and couldn't be done in one day. To make this into a 30 Day challenge vs. 10 Days, you would just give people a few days to complete each of the assignments. The longer each task takes to complete, the higher your drop-out rate is going to be. Stick to no more than 1 hour per day, with things that take longer broken down over several days. Or you could just pull out the parts of the course that take less time and that you want to make sure people achieve in a 10 day period. For example, the chapters in which they define the purpose for their list, set up their list, and define their audience can each be done in a day. However, the chapter on creating your lead magnet might be 2 days – one for brainstorming and one for creating it, which might need more direction. If you also have a license for our List Building Lead Magnets package, you could pull content from there to provide the extra direction. Or even give your customers a template for creating their own freebie checklist. The chapter on creating your squeeze page could also be split up, but you could add a short video of your own showing them how to use LeadPages or another tool to create an opt-in page quickly. Make sure you add your own affiliate link! For the actual content you send to people each day, you'd just pull the chapter content, put it into an email and/or on a hidden blog post (with a link in your email), provide a link to download the relevant worksheet, and schedule the emails to send out over the relevant period of time. You see how similar it is to the original? All I did was add my branding, change the title of the day, and alter the assignment a little. Are you starting to see how you can create your challenge content quickly, but still add your own value? 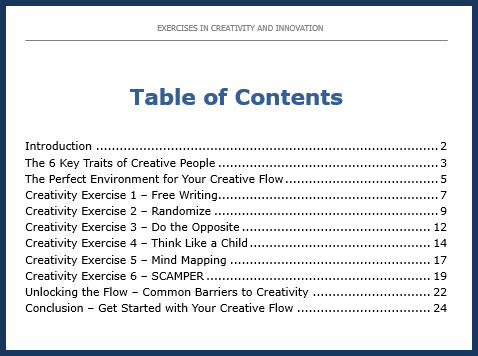 In our course on Exercises in Creativity and Innovation, people evaluate their creativity characteristics, identify the best environment for their creativity, and they go through several exercises for nurturing their creativity. Then they look at barriers to overcome, some tools to help them out, and they do some review and planning. For a 30 Day Creativity Challenge, you could break up the content over the course of the 30 days, having people do the exercises more than once. For example, with the exercise on ‘think like a child', you could ask them to do it each day for 4 days in a row. There's a workbook with almost all of our courses, so you'll already have something to send along with the relevant chapter. Just tailor it to your audience. And ideally, you'd also create a Facebook Group like the earlier examples where people can share their successes and obstacles during the challenge. If you already have a Facebook Group, you could ask people to use a hashtag when they post. That way, you'll be building a supportive community and giving people something to talk about and learn from. As you can see, creating your own 30 Day Challenge (or 10, 14, 60, 90 days) doesn't have to be a mountain of work. You can create the core content using Content Sparks products. Then spend the remainder of your time on marketing your challenge and interacting with your participants to give them support. There will also be lots of opportunities to sell relevant courses and infoproduct to help people on areas where they got stuck later. So be sure to keep track of issues you can help with. 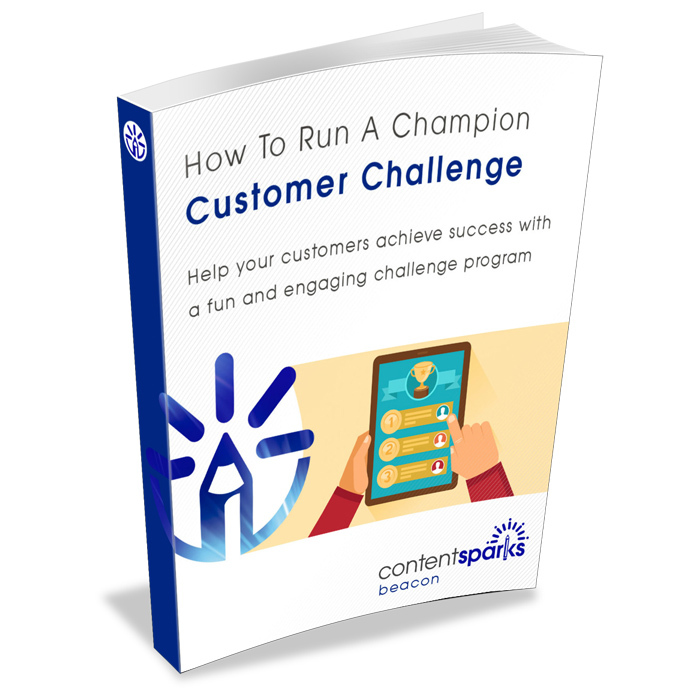 Are you ready to create your own customer challenge? We put together an 8-Step Worksheet you can use for planning your challenge, whether it involves using done-for-you materials from Content Sparks or creating your own from scratch. Want to skip the content creation side and run a challenge that's ready-to-go? 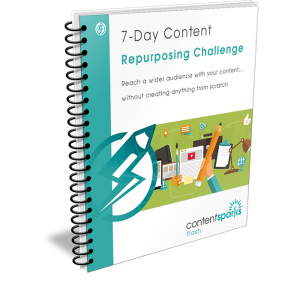 You'll get all the materials you need to run a successful challenge that teaches your participants how to reach a wider audience with their content… without creating anything from scratch. And when you're ready to teach others how to run a challenge…. You can edit the content in that course any way you want. Then put your name and logo one and share it with prospects or sell it for profit. You could even break it up to form your own challenge for your customers! You and Your group are Genius’s – Poetry and Prosperity in motion! Driven with Drive and know-how. Up there in the “Rich Schefren” strata (Strategic Profits). I can’t wait to get going with the solidification of my Challenges (s)! You may have made my day, month’s, life, challenges! Maybe 300% easier! Want to use your work as a kind of sylabus, checklist. Most all ideas, categories, titles, etc. my own typically. (Sound good?) A great way to finalize my years of work. So cool “guys”! Best product yet, sounds and looks like to me. Just about to buy it! PS Have you considered retro-fitting some of your past products into “back-end” Challenges. More profit or as incentive to buy existing main course? Abreviated and Consolidated game-like approach! Thanks, John! And yes, I did reply to your email earlier, so look out for that. I’m not sure I’d recommend using my same categories and sub-categories for yourself. It really depends on your audience. Maybe consider breaking it up based on level – beginner, intermediate, advanced. That might work better. I love the idea of retro-fitting some products into challenges. I was actually thinking of doing a challenge where I ‘challenge’ customers to set up one of their products over a set period of time. Eg, download, customize, publish, set up funnel, maybe record some slides as video. Stuff like that. I have to think it through. Hi Sharyn, thanks for including my blogging challenge in the section of challenges on Facebook. I would add to your post that you should be prepared to get your challenge out there and not be stifled by perfection – because your challenge will adapt and grow. Lol, I just gave you a shout-out in the Facebook Group for that challenge. It looks incredible. And don’t you have one on Facebook Live too? Love your tip about perfection. I know I suffer from that too. But I’d never have a single product out there if I waited until I had it just perfect.